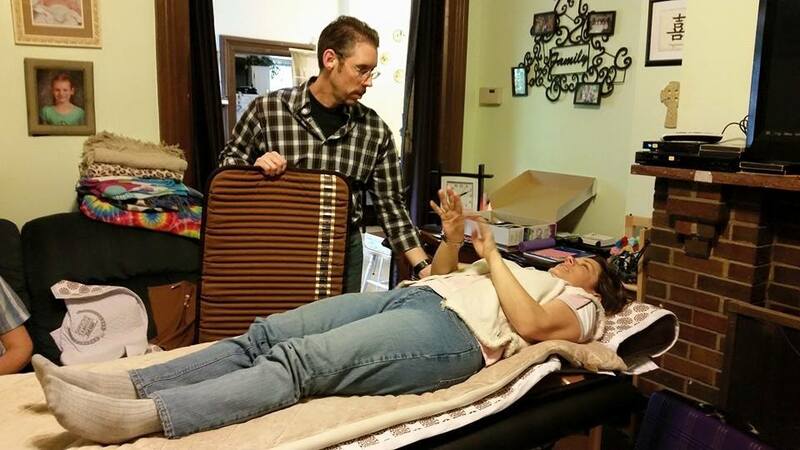 Dr. Todd & Eugena Austin recently hosted their 3rd quarterly Biomat Therapy training event in Virden IL on 5-2-15. 8 trainees were present from IA, IL & MO. VIRDEN, Ill. - May 11, 2015 - PRLog -- Dr. Todd W. Austin & Eugena B. Austin, L.M.T. recently hosted their quarterly Spring Biomat Therapy training event in Virden IL on 5-2-15. Eight trainees were present including four from the Quad Cities (IA & IL), two from the St. Louis metro area (IL & MO) as well as two from central IL. Guest presenters were Biomat distributors Nancy Tripp from the Quad Cities and Iva Jones from Nokomis, IL. Nancy spoke about "My Passion for the Biomat", while Iva gave a special presentation on "Helping Others with Their Health Challanges". Dr. Todd discussed in length the many Biomat products (Pro Biomat, Biomat Mini-mat, BioBelt, Quantum Energy Pad & Alkal-Life) and the Biomat business as well. Eugena gave a presentation about "How to Successfully Incorporate Biomat Therapy into a Therapeutic Massage Practice" like she's done at Austin Family Chiropractic in Virden, IL. Virden is located less than 30 minutes south of Springfield, IL on IL Route 4. PHOTO CAPTION: Biomat distributor Nicole Nichols from STLBiomat.com lies comfortably on the Professional Biomat with Quantum Energy Pad, while Dr. Todd Austin from Virden displays the 'Amazing 7-in-1 Biomat Mini' during the Spring '15 Quarterly Central IL Biomat Training Event. The Austins will hold their next quarterly Biomat Training event in Central IL on Saturday August 29, 2015 from 1 to 5 P.M. There is a limit of 12 attendees, by invitation only. The FREE event is open to healthcare providers, biomat users & biomat distributors. Dr. Todd & Eugena are currently training 21 other holistic healthcare personnel on implementing Biomat Therapy into their Chiropractic, Medical, Massage, Reiki, Hypnotherapy, Veterinary, Reflexology or Yoga practices. They are also training dozens of laypeople on how to incorporate the biomat technology into what Dr. Todd refers to as their '21st Century Medicine Cabinet'. The Biomat is FDA approved as a heat therapy device, but as Austin states "It reduces mild to moderate joint and muscle pain and inflammation by using specialized healing far infrared light similar to how a sauna works. We've helped over 400 Central Illinoisans with the technology in our clinic over the past 14 months with such conditions as back, knee & shoulder pain to feel better quicker in conjunction with cold laser therapy, chiropractic and / or massage." Any central Illinoisan who would like to try out a Biomat can do so at no charge with no strings attached at Austin Family Chiropractic on the west side of the Virden town square. It's what #DrTodd & #BiomatGena refer to as their clinic's complimentary 20-minute "Biomat BioBliss Experience". Please call 217-965-3100 to book your complimentary BioBliss session. Limit 1 complimentary BioBliss session per person.